compare a dog's structure and temperament to this standard when they exam each dog. An unaltered dog, 6 months or older, can be entered in one of a number of different classes depending on the preference of the owner. Some owners, referred to as owner-handlers, prefer to exhibit their own dogs in the Bred by Exhibitor class, or any other class they choose, while other owners choose to use a professional handler to show their dog. Cosmic PWDs are always owner-handled. 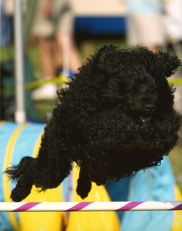 A dog show is a good event to attend if you are interested in seeing a variety of Portuguese Water Dogs and want the opportunity to talk with a breeder, owner, or handler about the breed. You can search for a show near you at www.akc.org. has the team working, from land to water or off the boat. 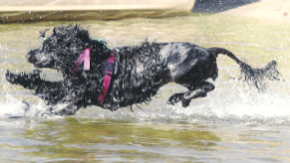 at preserving the breed's historical working background by teaming up with your dog and making a splash in water work. to be an excellent agility dog. make plans to attend a trial. Do not be afraid. others try from the outside. The Portuguese Water Dog has a working heritage of retrieving gear, placing nets, and carrying messages between boats and from boats to shore.